We adore sliders….small burgers seasoned to perfection with all sorts of creative toppings. Fluffy buns tempt even more. The fact that you can pop a few for a satisfying meal ~ or a single for an appetizer option. Dig in. Oh. Thai spices always make everything better! These Thai Spice Chicken Sliders were polished off in minutes. OK, maybe seconds. Looking for an amazing Father’s Day or July 4th recipe for BBQ’s? Here ya go….Get Grillin! Serve these hot little numbers for appetizers or as a main course. What makes these burgers so special? Ahhhh so glad you asked. Well to start, ground chicken is mixed with all kinds of Thai spices & seasonings. Mix in some green onion & cilantro. Then to make things even more fabulous & mouthwatering….grill up soft & slightly sweet Kings Hawaiian dinner rolls. People go Pupule for these rolls (thats Crazy) in Hawaiian. Follow these guys on Facebook for some amazing recipes! Top it all off with Sriracha Mayo sauce, bok choy leaves & fresh cilantro. Slice open a big juicy pineapple. Serve chunky pieces of that on skewers with your sliders. Disclosure: I work with Kings Hawaiian to bring you wonderful recipes. All thoughts & opinions are my own. These look amazing Marla! Dying to try this recipe!! I saw these on FB this morning and it has got me drooling! I love thin burger sliders like this especially one that is thai-spiced! I love these flavors all combined in tiny little burgers is incredible! Over the top amazing! So perfect for summer grilling! 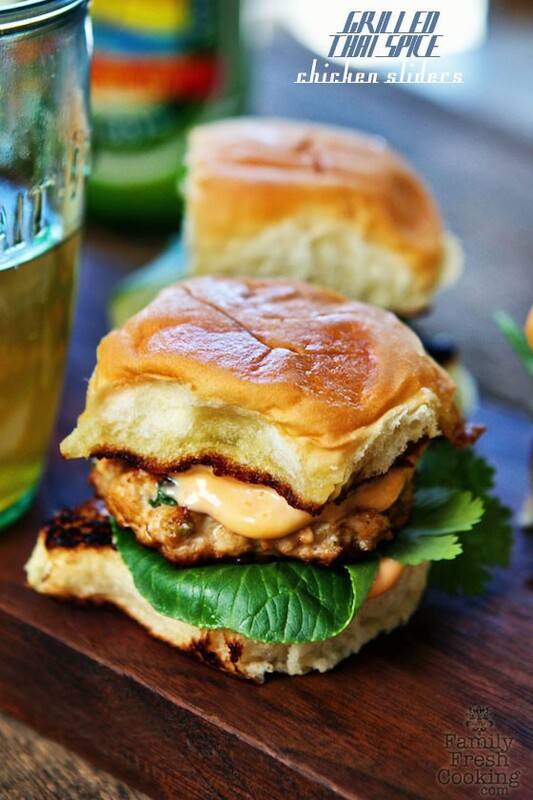 Perfect sliders for grilling season, love the Thai flavors! These sound amazing! I could live on Hawaiian Sweet Bread, it never lasts in our home. And the grilled Thai spice chicken in the middle, so perfect for a summer meal. This looks really yummy. Something different to grill other than beef. These look so tasty! Its 7pm here and my mouth is literally watering!! Woah! Love the look and sound of these sliders! Pinned! I found this recipe via Blogher. It’s easy to make and looks delicious! These look incredible!! Love the thai flavors!! These have all the flavors I love! These sound just too good. I know they would be a big hit with my husband especially! Love grilling season! These look so good! And I love that the burgers are dairy and egg free. Perfect for my family! Thai Chicken Sliders | Ramblings of my Life! Just made this without the red chill paste because I couldn’t find it and it was rather bland so I added some Thai spice mix I had and it turned out great! Made these, so good, the flavor was wonderful…Will definitely make again! Did you use ground chicken breast? I saw these and realized I needed to make them IMMEDIATELY. So…I did! They were incredible. I defrosted what I thought was A bs breast but it turned out to be thighs but they turned out great! Thanks so much for the recipe. Will be going back to this one again and again! Hi Nancy! So glad you tried these burgers, a favorite here for sure! Stay tuned for my next version….Mediterranean sliders, which I’ll be posting any day! Just made these for supper, this is a keeper recipe! I had to add pinko bread crumbs as my mixture was too wet. Put them in the charcoal grill and they turned out perfectly. My hubby and I loved them. Thanks so much for a great recipe!